Lowdown: The only good policeman in a remote Irish town is the esoteric one. As far as remakes of High Noon are concerned, we probably thought we’ve seen them all already. That’s a wrong assumption to make, with The Guard proves to be a High Noon done the Irish way. Our Gary Cooper for an hour and a half is Sergeant Gerry Boyle (Brendan Gleeson), to whom we are first introduced when he indifferently sieves through the dead bodies of teenagers who killed themselves driving recklessly on a high. Our policeman stops his operation only upon finding an ecstasy tablet. Which, of course, he consumes. The political incorrectness of our Gerry doesn’t stop there. He openly welcomes call girls to his dwelling, he openly admits to trying out drugs (and mocks claims that the addiction to crack is established after a single exposure), he deals weapons with the IRA… You name it. But he is good hearted about it all and, in his way, he truly cares about his job and the community – as we’ll quickly find out, much more than most of the rest of his colleagues. The plot thickens when a black FBI agent (Don Cheadle) drops in to catch a notorious drug dealing gang (featuring, amongst others, Mark Strong). The FBI seeks the cooperation of the local Irish police, but the latter seem to be mostly messing them about. The exception is our Gerry, who is both openly racist towards Cheadle’s character as well as providing genuine contribution to its efforts, even if the latter is done the Irish way. I gave too much away by hinting things develop towards a High Noon like replica, but that is not the point of The Guard. The point is the path to get there, and that path is full of witty jokes woven around the Irish setting and its peculiarities, particularly those of our chief protagonist. 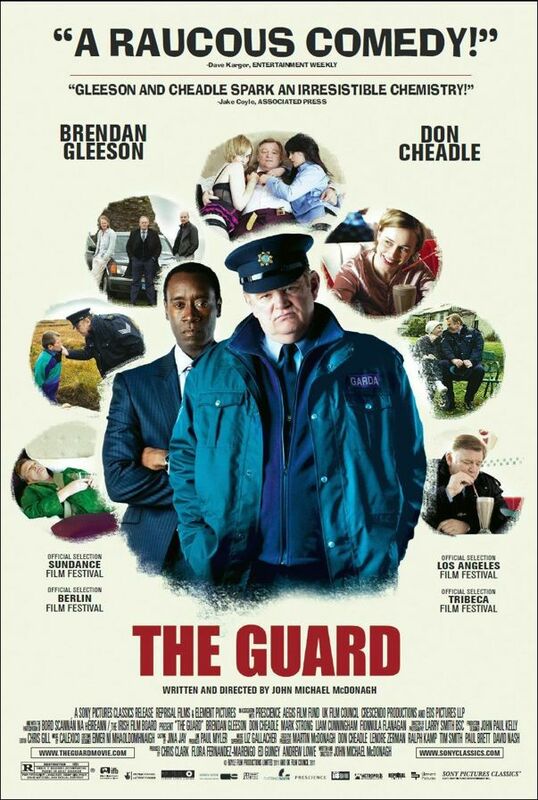 In a world awash with political correctness, The Guard serves as a good reminder that there are better ways to do things if we stop to think about it. These start with better ways to make films than the crap Hollywood pours all over us, a point well delivered through a simple unassuming comedy. Just a word of warning before I finish off: it can be quite hard to understand what those bloody Irish are saying. When they speak Gaelic it’s easy because of subtitles; it’s when they speak English that us viewers have to work hard. Best scene: Our sergeant wakes up in the morning in totally unglamorous fashion, wearing only Y-fronts, and gives his balls a good rubbing. The things they never show you at Hollywood! Overall: A simple yet entertaining film. That is to say, The Guard is nice! 3 out of 5 stars.